One of the most popular ATV tires for the avid fans of this all-terrain vehicle is the mud-slinging and one hell of a model Terminator ATV tires. This Terminator tire reviews will give you the ultimate advice in procuring one of the best designed tires the industry has to offer. Although the tires are all made in durable rubber, they are all recyclable and made through the latest state-of-the-art technology. There are various ATV tires and wheels that are amazingly price much higher than the Terminator but obviously have inferior qualities. You could give judgment for your worthwhile investment in tires after you read this informative review. The Terminator ATV tires in mud go a very long way stretching this terrain and conquering all possible obstacles on their path. This tire has one of the deepest tread ever designed for an ATV. Averaging 2 inches in depth, the tread goes a long way towards attaining invincibility for a total fun and adventure, add to it, the best rides and comfort a rider may experience. Terminator tires are Super ATV’s premier products that come in series sizes. Super ATV is one of the leading brands that sell various automotive products such as tires and accessories, aside from ATV tires, for motorcycles, power sports vehicles and other items. You could pour your trust in this company. We have selected 3 of the best among the best super Terminator ATV tires available on the online stores and you could be amazed of their performance. The following products are picked and considered the “elite” tires in the ultimate ride of your life. Note: The size or product dimensions indicated is read as H (height) X (width) X ID (wheel inside diameter) in inches. The psi unit is read as pounds per square inch absolute pressure. This Terminator model ATV tire has a 2-inch deep tread, virtually invincible in muddy terrain. Having a section width of 10 inches and rim diameter of 14 inches, this tire could literally crush mud with its angled tread design and consequently drive the mud away from the vehicle and its rider. Constructed in composite 6-ply, the tire is primarily made for off-road use. The tire capacity is an astonishing 585 lbs. maximum load at 7 psi tire pressure, more than enough to carry the heaviest of the passenger. The tire grips tightly to all terrain types unequaled by its competitors in the same category. One of the finest models according to various Amazon reviews by buyers. The traction is proven to scale even the steepest road and hills with ease. The Super ATV Terminator users agreed that this tire could relieve the pressure impacted on the ATV’s shock absorber especially the back. That is a big relief for a hardworking part. The product has the following dimensions: 29.5 X 29.5 X 10 inches. 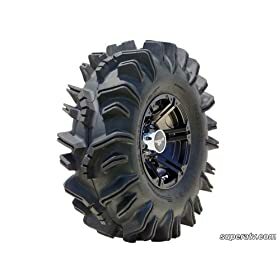 Also with 2-inch deep angled tread, the Super ATV Terminator tire sized at 28 inches (height) could be good enough for low-level ATV that trails the muddiest surfaces of the earth. Off-road capable, this durable and immensely treaded product by Super ATV could literally terminate the toughest and dirtiest pathways. The tire is almost skid-free to any curve it takes. One of its distinguishable properties is its adaptability to fit in almost all old models of ATVs. Buyers may consult online catalog for vehicles this tire could fit in. Its built-in rim guard provides protection for the destructive effects of dings and dents virtually cause by the harshest elements present in any ATV tracks. The 6-ply tire, 585 lbs. load capacity is considered as one of the leading brand compared to other models in terms of units sold. Priced slightly lower than its predecessor, the tire’s dimensions are: 28 X 10 X 14 inches. The tire’s width could easily handle the un-friendliest and muddiest environment. This tire could fit also in various models of UTVs and side by side that are utilized in remote areas. Slightly smaller than the previous tire (2 inches smaller in wheel diameter), this tire is best for low level ATVs as its rim diameter is only 12 inches, section width of10 inches and tread depth of 2 inches. The angled tread is truly deep that is why it could attain longer performance than any other tire with shallow tread. When used in muddy terrain, the tread just spit the mud away from the vehicle giving the rider habitual comfort and style. This tire could easily outperforms its closest competitors on the same size category as this bias constructed tire eliminates the skidding and sliding nature of other brands. Its small size could have the advantage in banking and tight grip in virtual all rugged terrain. Its versatility to handle sharp turns will provide power steering on the handler. Serves both muddy and treacherous terrain, this Terminator weighs only 40 lbs. and yet could muster the capability of a tire twice its size. For best results, manufacturer limits the air pressure for this tire at 6-7 psi. Additionally, load capacity is pegged at 585 lbs. so as not to overload the unit. Over loading may shorten the useable life of the tire. When buying Terminator ATV tires on sale, there are websites which could inform any fanatic and advise them of its availability. However, when they like to purchase in rush, there is the Amazon sites available 24/7. The Terminator series of tires is a proverbial bargain budget conscious folks and ATV enthusiasts could take advantage of. Ingeniously engineered to promote safety and ultimate comfort for ATV riders, the tire series gave them various choices on which height and reliability their vehicle would run. The varying sizes, but no quality diminished, ATV tires and wheels could now be reversible with these different size offerings by Super ATV. For the tires to achieve long lasting service, it is also advised to keep the tires’ air pressure at 5-7 psi at all times.